Real barbecue is the antithesis of grilling. There’s nothing quick and easy about it. To properly cook a pork shoulder over smoldering coals for hours until its tender, moist and humming with smoky flavor takes patience and attention to detail. So it’s no wonder we only pull out the smoker now and then. Every time, we bite into pulled pork straight out of the smoker, though, we regret that we don’t do it more often. It’s hard to beat the taste of well-marbled pork cooked until the outer layer becomes deep brown and crusty. 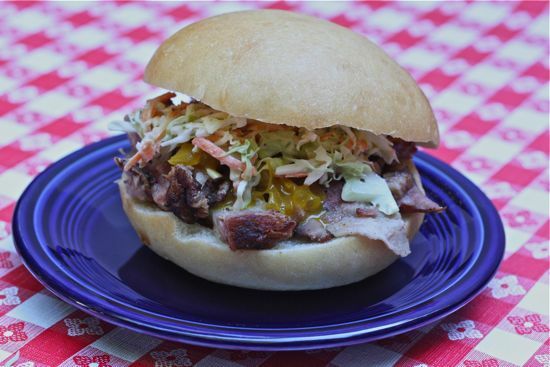 Pile it on a bun with tangy, crunchy cole slaw and life doesn’t get much better. This is a can’t-miss dish for a party. And just the thing for the waning days of the summer vacation season. The recipe is an adaption of The Renowned Mr. Brown from Cheryl and Bill Jamison’s “Smoke & Spice” (Harvard Common Press, 2003). We use a Weber Smoky Mountain vertical water smoker, known affectionately by its fans as the Bullet. It’s solidly built, and the heavy metal body holds heat well. However, it’s also possible to smoke the pork on an ordinary charcoal grill using the indirect method. Barbecue guru Steven Raichlen explains the technique here. The critical elements are low, even temperatures and time – 6-10 hours of time. And of course, there’s the all-important question of sauce and cole slaw. I prefer the South Carolina mustard sauce I found in ”Steven Raichlen’s BBQ USA” (Workman, 2003) and the creamy, vinegar-laced slaw from ”Thrill of the Grill” by Chris Schlesinger & John Willoughby (Morrow, 1990) Put them all together and you have a sandwich you’ll never forget. Sure, real barbecue takes time and effort. But it’s worth it. The night before you plan to barbecue, combine pepper, paprika, sugar, salt, mustard and cayenne in a small bowl. Massage pork well with about half of the rub. Transfer pork to a plastic bag, and refrigerate it overnight. Store rest of rub in a covered container at room temperature. Before you begin to barbecue, remove pork from refrigerator. Pat down meat with another coating of rub. Let the pork sit at room temperature for about 45 minutes. Prepare smoker for barbecuing according to manufacturer’s instructions, bringing temperature to 220 to 250 degrees. Transfer pork to the smoker and cook for about 1 1/2 hours per pound, or until it’s falling-apart tender. The internal temperature of the meat should reach about 190 degrees. Mop the pork about once an hour in a wood-burning pit, or as appropriate for your style of smoker. Remove pork from smoker, wrap in foil and let it sit for about 15 minutes, until cool enough to handle. Pull off chunks of the meat, and either shred or chop them as you wish. Make sure each serving has some of the darker, chewier Mr. Brown crust along with the lighter interior meat. Serve with barbecue sauce and cole slaw. In a small bowl, blend mayonnaise, vinegar, sugar, celery seed, and salt and pepper to taste, and mix well. In a large bowl, combine cabbage and carrots. Pour dressing over mixture and blend well. Refrigerate until serving time. Melt butter in a heavy non-reactive saucepan over medium heat. Add onion and garlic, and cook until soft but not brown, about 3 minutes. Stir in mustard, brown sugar, vinegar and hot sauce; add 1/2 cup water. Let the sauce simmer, uncovered, until thick and richly flavored, 6 to 10 minutes. Taste for flavor, adding more hot sauce as necessary and seasoning with salt and pepper to taste. Let sauce cool to room temperature before serving. Any leftover mustard sauce will keep for at least a week stored in a clean jar in the refrigerator. Bring to room temperature before using.